The Scientific Advisory Board (SAB) visited the CDN for two days on April 11-12, 2016. Chaired by Prof Erin Schuman, the SAB comprises independent academic international experts. 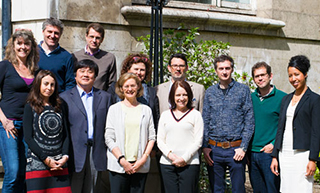 The committee meets every other year in London to give feedback on the Centre's research performance and to provide suggestions for the Centre’s future development. The main focus of this year’s meeting was to review the Centre’s progress over the previous two years and to provide strategic guidance on research, funding and strategies for growth. During their visit, the SAB also had discussions with the Centre’s Group Leaders as well as Postdoctoral researchers and PhD students.